In the previous post I demonstrated how to implement a very basic transport extension over an in memory message bus that supports request reply MEP. At the end of that post I created a console application and establish the service and client directly through the channel listener (on the server side) and the channel factory (on the client side). But this is not the WCF usage that we are familiar with. If you have been using the WCF for a while the common pattern is to create a ServiceHost on the server side and a ChannelFactory<T> on the client side. Then we will using the ChannelFactory<T>.CreateChannel to get an instance of the service contract interface so we can invoke the service remotely as if it’s locally. Using the “Add Service Reference” in Visual Studio or the “svcutil” is the same way as using the ChannelFactory<T> on the client side. In fact the Visual Studio will call the “svcutil” and generate a client proxy to us, which is similar as the service contract one but will some connection functions. Based on the transport extension we had finished so far, we can using the ServiceHost and ChannelFactory at once. 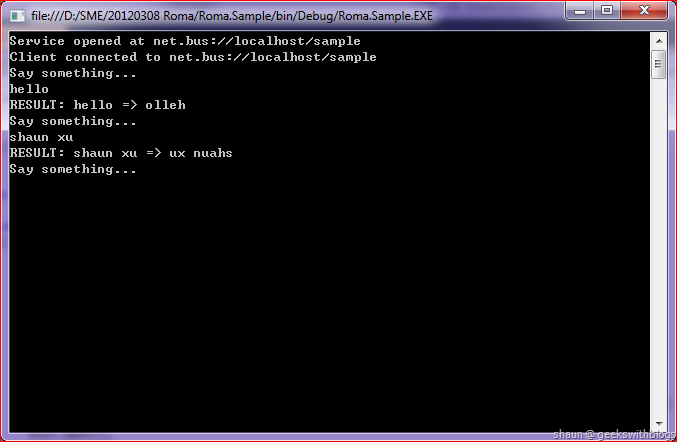 But since we just implemented the synchronized methods, for example the ReceiveRequest. We must indicate to WCF infrastructure to use the synchronized methods. Now I will describe how to amend our transport extension to support the asynchronous mode channel creation and message operation so that we can use the ServiceHost and ClientFactory<T>, which is the way that we are familiar with. Again, this is not mandatory for transport extension since it works well even though only support the synchronous mode. But in order to maximize the performance and usability, this is very important. 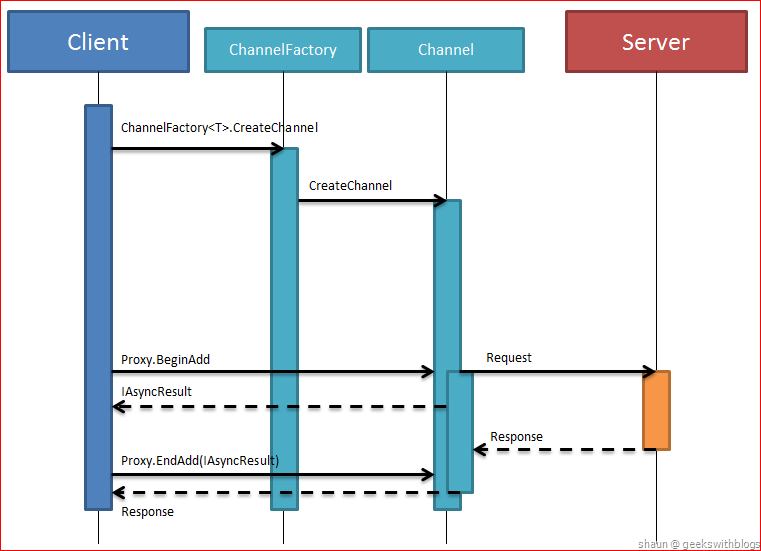 On the client side the transport binding element will create the channel factory and it will initialize a request channel object in its CreateChannel method. All of them are invoked synchronously and there’s no related asynchronous methods available. This means in WCF, the client operation will always be invoked synchronously. Although we can generate a client proxy class from the “svcutil” with the asynchronously methods, this will only affect on the calling thread. The channel factory and channel will still be created and invoked synchronously in its thread. It’s the same on the client side channel, the RequestChannel in our case. It only support the synchronously method to send the request message. So on the client side we don’t need to modify anything. On the server side it would be a little bit complex. In WCF one service could be able to handle multiple requests at the same time by using the different threads. This means on the server side besides the synchronous methods we must implement the asynchronous ones to support the concurrency mode. As we know the ChannelListener will create a server side channel when any request came to. In our current code we just initialized a new ReplyChannel instance and returned in the OnAcceptChannel method. But if we are going to use the ServiceHost class to establish the service we must implement its asynchronous method pair, which are OnBeginAcceptChannel and OnEndAcceptChannel. One of the implementation is very simple, we can create a new delegate that point to the OnAcceptChannel method we had done before, and use the asynchronous invoke methods to implement the OnBeginAcceptChannel and the OnEndAcceptChannel. We will define a delegation and assign the OnAcceptChannel to it in the class constructor, and use the BeginInvoke method in the OnBeginAcceptChannel while EndInvoke in the OnEndAcceptChannel method. This is OK and works when using the ServiceHost, and we will see that we are going to use the same way when amend the ReplyChannel part. But this is not the best way of doing the ChannelListener. It’s because if we are doing like this all incoming request will cause the service to try to create a new ReplyChannel, regardless if the server have the enough computing and memory resource available. In WCF we can define the throughput on a server so all client request will be queued on the server, and the server will create the channels based on its availability. Microsoft gives us a very good class to implement this queue with the throughput controlling, as well as the asynchronous enqueue, dequeue and dispatch methods, which the name is InputQueue<T>. InputQueue<T> was not provided within the BCL of the .NET Framework, although it’s very useful. But there are many ways to get it. One is to use some decompile tool, such as the ILSpy, to get its source code from the System.ServiceModel.dll. It’s an internal class inside the System.ServiceModel.Chanels namespace. Alternatively you can download the WCF samples and after installed, you can find this class in the folder \WCF\Extensibility\Transport\Udp\CS\UdpTransport\InputQueue.cs. Below this is source code of this class I’m going to use in our example. 5: // IOThreadScheduler.ScheduleCallback to get to a "safe" thread. 9: /// Handles asynchronous interactions between producers and consumers. 19:     //Stores items that are waiting to be accessed. 24:     //in an ordered list so consumers get serviced in a FIFO manner. 38:     //Represents the current state of the InputQueue. 39:     //as it transitions through its lifecycle. 392:     //Ends an asynchronous Dequeue operation. And in order to cooperate with this InputQueue<T> we also need a asynchronous result class, which will be inherited from the IAsyncResult interface. 3: /// that wraps a ManualResetEvent. 77:     // of the operation and notify the callback. 82:             // It is a bug to call Complete twice. 91:             // we do not need to worry about a race condition. 115:     // the callback, it will capture the exception and store it to be thrown during AsyncResult.End. 123:     // ensures the asynchronous operation is complete, and does some common validation. 165: //An AsyncResult that completes as soon as it is instantiated. 208: //A strongly typed AsyncResult that completes as soon as it is instantiated. I’m not going to explain more deeply into the InputQueue<T> and the AsyncResult classes. If you want to know more about it there’s a very good blog post to be reference. Then with this new scaffold let’s amend our ChannelListener. First we will define a local variant of the InputQueue<T>, where the type parameter would be the IReplyChannel. This means we will queue all request channel in this class. We also need a local variant for currently using channel and an object for locking. And initialize them in the constructor. Since the InputQueue<T> need to execute some procedures when terminate we have to implement the OnAbort, OnClose and OnClosed virtual methods to close the InputQueue<T>. And then we will create an internal method that ensure the current channel is available. It will check if the local variant _currentChannel is null. If yes then it will create a new channel from another private method called CreateChannel, which we will implement in the next step, and assign the OnChannelClosed method to its Closed event, and then enqueued into the InputQueue<IRequestChannel>. If not, which means there’s a channel object available, we will not do anything here. Now we can use them to finish the asynchronous BeginOnAcceptChannel, EndOnAcceptChannel, and we will also amend the synchronous OnAcceptChannel as well. 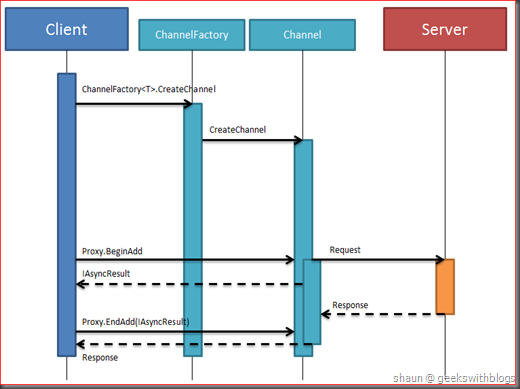 The ReplyChannel created from the ChannelListener also need to support the asynchronous functions in order to make it work with the ServiceHost. In this case we will just use the asynchronous delegate invoke. Since we have had the synchronous ReceiveRequest method, what we need to do is to create a delegate from it, and invoke its Begin and End invoke method in the BeginTryRecevieRequest and the EndTryReceiveRequest methods. Initialize this delegate based on what we did in the ReceiveRequest method. And invoke it asynchronously in the BeginTryRecevieRequest and the EndTryReceiveRequest methods. The ReplyChannel had been modified finished and we don’t need to change anything in the RequestContext. Then let’s have a try. Now we will use the way that you are familiar with to test our transport extension. There is no channel listener, no channel in our test code, and the service business logic will not be mixed within the service hosting code. Let’s have a look. First we will create a service contract interface and a service class which implement it. 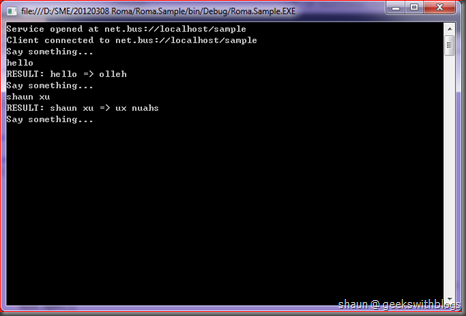 Again, we will use the string reverse as the sample. And in the main function we will create and open the service by using the ServiceHost. But since we didn’t implement any configuration extension so for now we have to use the code to set the binding and address. And we will use the ChannelFactory<TChannel> to create a client side proxy. Then finally invoke the service by the proxy the ChannelFactory generate to us. And this is the screenshot when I was running this code on my machine. But don’t forget our goal, scaling-out on the server instances. Similar as what we did before, we will create more than one ServiceHost instance that listening on the same endpoint, which can handle the client request at the same time, to simulate the cross process or cross machine scaling-out scenario. 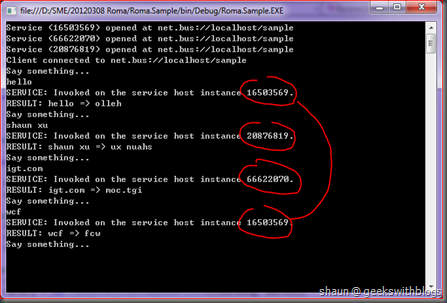 As you can see I created three hosts and one client. In order to display which service host is handing the request I add one line code inside the service implementation class that display the current service host’s hash code. So let’s have a look on what’s going on. As you can see I invoked the service method four times and the first three of them was handled by the three different service host, which means scaling-out to my service instances. 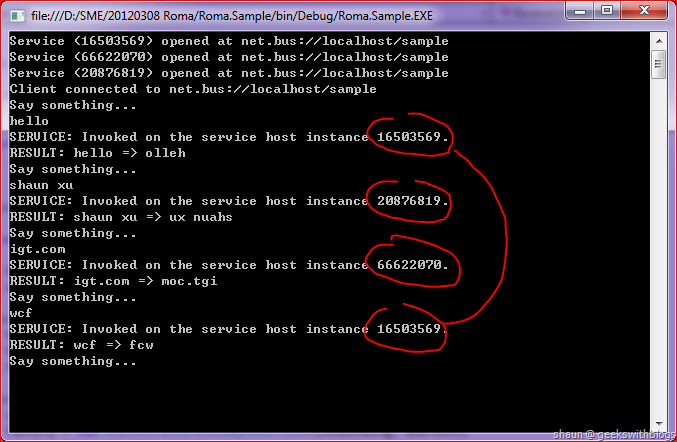 And the fourth one was handled by the first service host instance. In this post I described how to amend our extension so that we can use it in a better way for service definition, implementation, hosting and client invoking. Once we implemented the relevant asynchronous methods in the ChannelListener and ReplyChannel we can use the ServiceContract interface to define the service contract, and use the ServiceHost to let WCF create the service class instance, open the service. On the client side we can use the ChannelFactory<TChannel> to get the proxy class of our ServiceContract interface. All of them are what we had been doing for a long time and familiar with. Till now we had finished the basis of the transport extension, even though we had just implemented the request reply MEP. But as what I said in the first post, all other MEPs can be implemented by introducing the more ChannelListener, ChannelFactory and Channel. But things always not as simple as we expected. In the next post I will show you how to implement the datagram MEP, with some code refactoring, with some bug fix. You can download the source code of this post here.